To download your purchased software again, please click here. If you've purchased NotePerformer, please download the full version installer using your personal download links. Run the installer and proceed through all steps. The full version overwrites the trial version. and move NotePerformer to the top. This makes NotePerformer your default choice of sounds in Finale, when creating a score or when running "Reassign Playback Sounds". NotePerformer may be uninstalled from "Add/Remove Programs". Open MIDI/Audio &rtrif; Sound Map Priority and move NotePerformer to the top. This makes makes NotePerformer your default choice of sounds in Finale, when creating a score or when running "Reassign Playback Sounds". 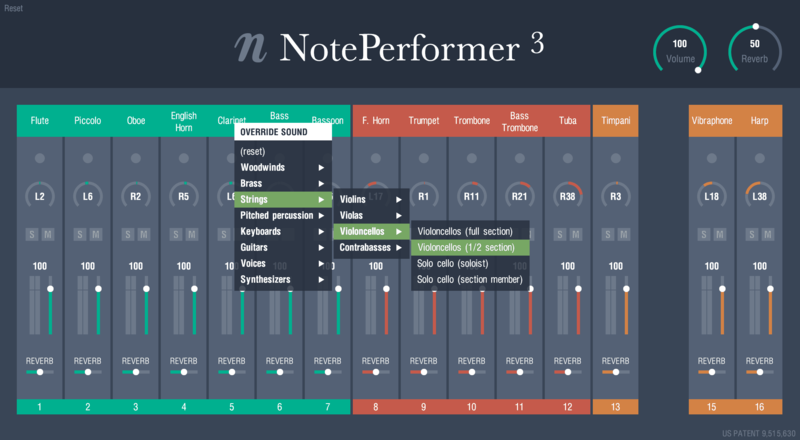 If our sound map is missing, please run the NotePerformer installer again. This is usually necessary when you install a new version of Finale. You must use Default Prefs as your Human Playback Configuration. This is the default setting in Finale. 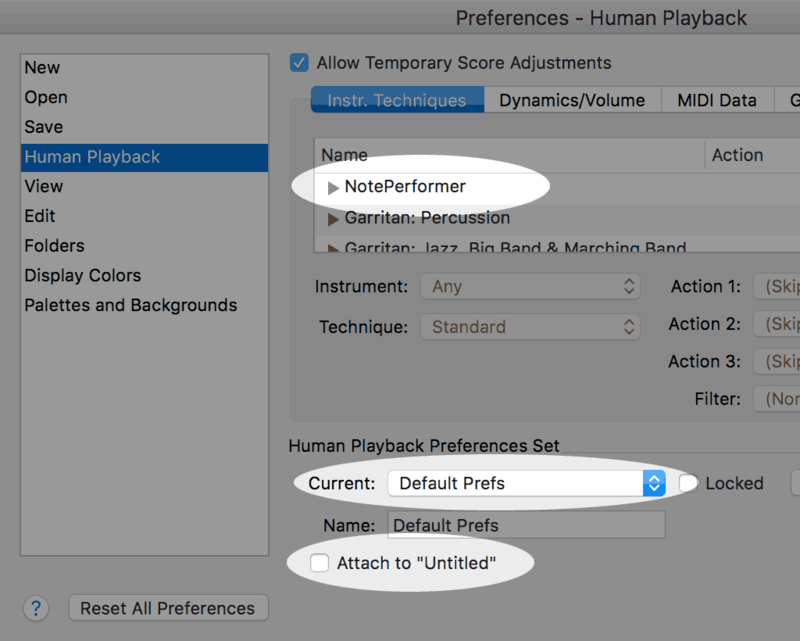 We extend your Default Prefs configuration with NotePerformer's custom Human Playback Preferences. To get the correct sound for a staff you simply select the appropriate instrument from the Score Manager. Using our supplied FinaleScripts we add support for a few techniques such as a2, a3 and non vib which are not described by Human Playback. These can be assigned manually to an expression whenever you wish to use them. For each technique, there's also one that cancels that technique (for example, "a2" is cancelled by an expression to which you've assigned the "UNISONS ‑ solo/default" FinaleScript). To assign playback for an expression, select the handle and run the appropriate FinaleScript. We also include a FinaleScript for assigning tenuto to its articulation, if you wish to use tenuto, because tenuto isn't otherwise detectable in Finale. 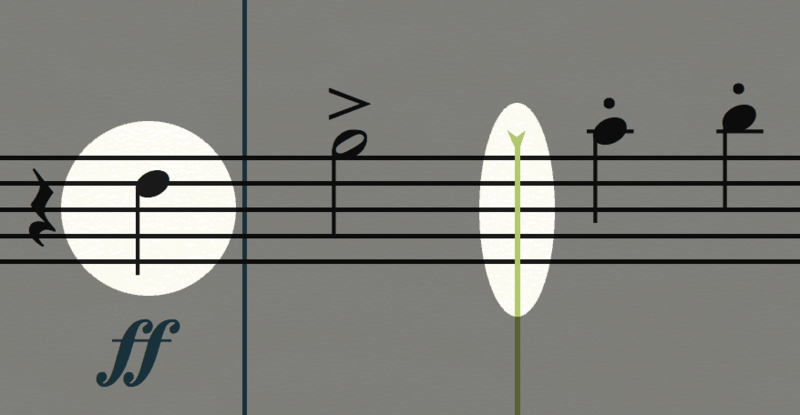 We've assigned tenuto to the lowest possible note velocity, which is 1. Opening the NotePerformer interface from Finale reveals our own high-resolution mixer. By clicking the small "pencil" icon next to each respective NotePerformer bank. The mixer is initially empty, but is populated with instruments when you initiate playback. If you remove staves from the score, you can click Reset in the upper-left corner to clear lingering instruments from the mixer. Solo/mute, volume and reverb work globally across all NotePerformer instances. Channels are automatically grouped and color coded according to instrument family. Double-clicking restores the default value for a parameter. 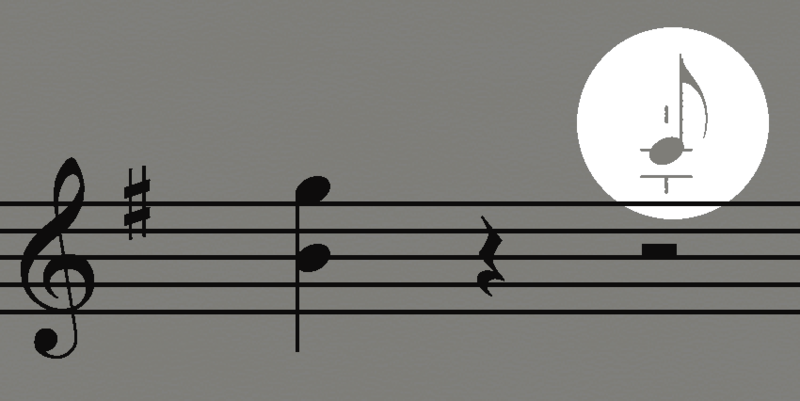 Instruments have different pan defaults, reflecting orchestral seating. 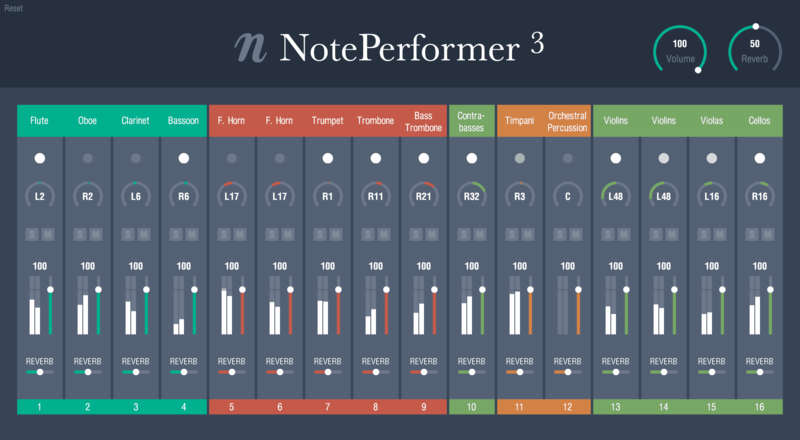 NotePerformer supports custom organ registration by inserting a MIDI CC message into the score. 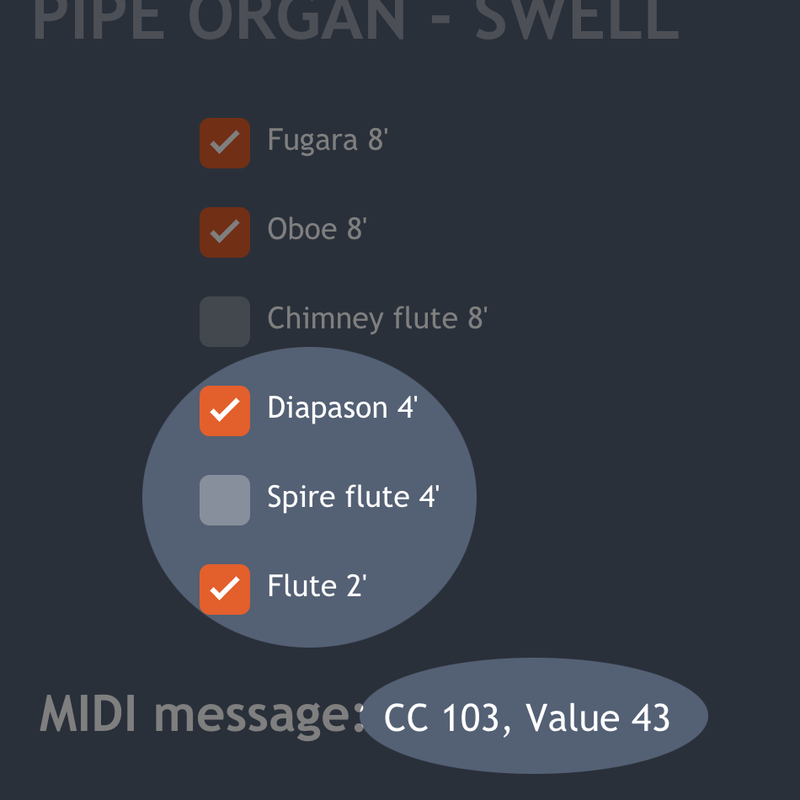 In Finale, you may attach a MIDI message to your own expression. Go to Expression Designer &rtrif; Playback. Enter Controller "103", and Set to Value according to our calculator. Clicking an instrument's name in the mixer allows you to override the sound for that MIDI channel. This provides access to sounds that are not mapped by your notation software. Or simply for using a different choice of sound for a staff. Or for accessing additional drum kits such as rock, brushes or electronic drums. 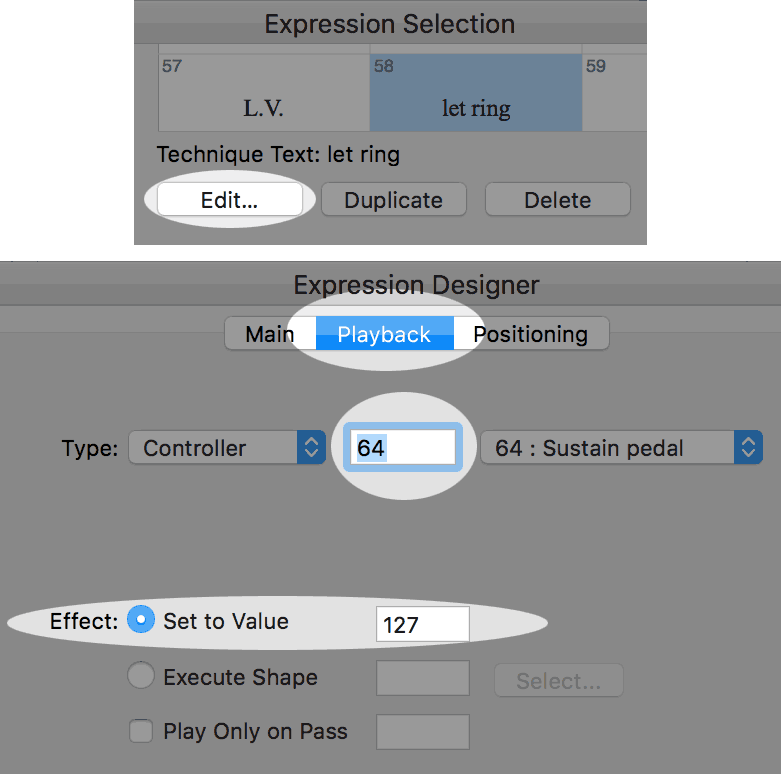 For reference, you may add custom MIDI CC events to any expression in Finale. This is done by editing the Playback settings for that expression. 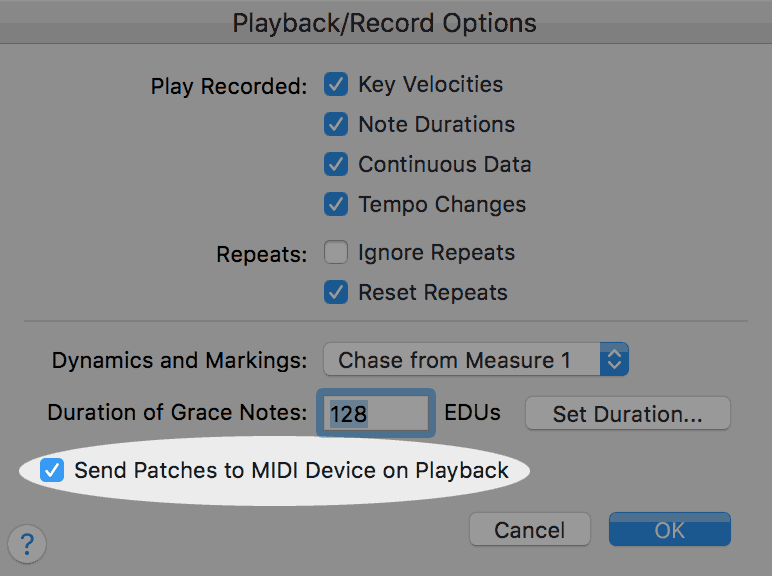 The Send Patches to MIDI Device on Playback option must always remain selected. If you deactivate it... the NotePerformer mixer is never populated, and you only hear trumpet sounds. We sometimes encounter Finale documents where note lengths are played back incorrectly. It may happen even when note lengths look fine from the MIDI Tool. The issue was caused by running the Apply Human Playback plug-in. 1. Select the entire score. 2. Go to the MIDI Tool. 4. 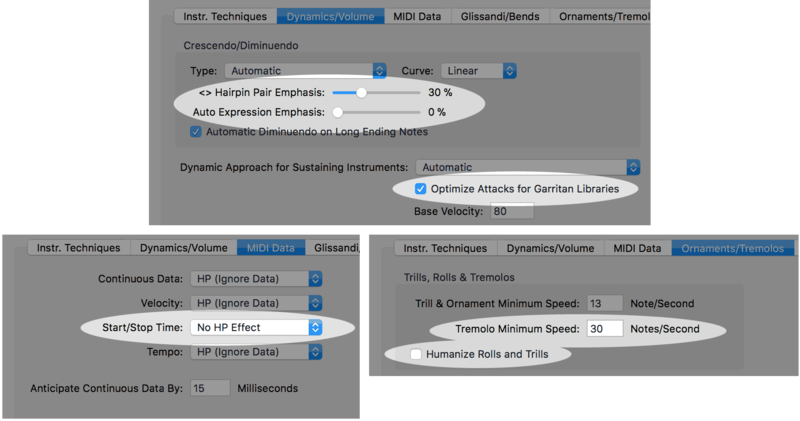 Choose the Clear MIDI Data option, click "Apply" and then Close the dialog. 5. Run MIDI Tool &rtrif; Clear. We do a few tweaks to your Default Prefs global playback preferences, which may be good to know about if you want to change these settings yourself. The default value for Hairpin Pair Emphasis is changed from 50% to 30% (for a custom setting, use any value but 50%). The default value for Auto Expression Emphasis is changed from 40% to 0% (for a custom setting, use any value but 40%). We make sure that Optimize Attacks for Garritan Libraries hasn't been deselected. Start/Stop Time is set to "No HP Effect" to preserve the written length of notes. Tremolo Minimum Speed is increased from 12 to 30 to improve our unmeasured string tremolos and percussion rolls. Humanize Rolls and Trills is deselected because it introduces unevenness. With older Finale scores the volume of the first bank is sometimes set to zero, for unknown reasons. In which case instruments from the first bank will not produce any sound. by setting the volume of all banks to 100. The playback line in Finale is way ahead of what you hear. The playback line is off-beat by one second because Finale doesn't currently latency compensate. Please add this MakeMusic ♥. Since Finale 26, the issue below has been resolved. When entering notes with your mouse or keyboard, there is a one second delay before you hear the sound of the note. It happens because Finale doesn't currently report the transport playback state to plug-ins. The result is that NotePerformer's read-ahead algorithms always remain active, even when playback is paused, causing a delay in sound output. If your Windows User Account was named such that it includes non-English characters Human Playback Preferences becomes inoperable in Finale. So, if you login to Windows by the name of (for example) François, Jörg or 伟 you can use only the built-in sounds in Finale. The only workaround that we know of currently is to create an alternative Windows user account using only A-Z characters to run Finale from.